For tips on loading etexts and ebooks to your electronic device (Kindle, Nook, etc. ), see this page. 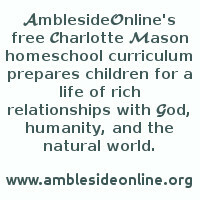 Note from an AmblesideOnline user . . . I just wanted to encourage those of you who are hesitant to use printed e-texts to not be wary!! 4. write summaries inside their own book. I could go on, but I am sure you get the idea. I had originally planned to just print these books once and call it done, but they became personal keepsakes!! I now have to start printing them for my younger set. One thing I do differently now, is I use brads to bind my 3 ring holes and the use colored duct tape over the spine. I can write on the spine that way. I also make sure my margins are quite wide and I use a nice clean font that is at least 12-14 point for my young ones. Thank you to the advisory once again!!! Question: Does everyone else print out the e-text as needed? Or do you have your children read it from the computer screen? There are several ways to do this, and I think we probably have somebody using each of them, and maybe some we've not thought of. Some print out the e-text all at once, some a chapter at a time. When I print it out I like to save it to my word processor and fiddle with the text size, style, and color. We refill our ink cartridges and print on scratch paper from dh's work, so the cost is minimal. I also usually change it to two columns to save on paper. Since we do print on scratch paper our copies are only single sided. You can do double sided by first printing only the odd numbered pages (most word processor and printing programs will give you an option to do this, you just have to hunt), then flipping the stack and printing the even pages. When we do print out the text we keep it in a peechee folder (cardboard folder with prongs in the center for notebook paper), or a three-ring binder. We never read it from the website itself. Sometimes my children have read it from the screen and when we do this I copy and paste the text onto MSWord, fiddle with the color and text size and style and background color as well (shades of green are easier on the eye). I can make the text as large as we like for ease of reading when I save it to disk. Then they put in the disk and read it from the screen, but the eye strain is minimal. Question: Is it more beneficial to purchase the books that are available than using etexts? I prefer etexts. I can tweak the font size and columns/margins to my own taste and I never feel guilty about writing in them. I staple mine (I bought a heavy-duty stapler at Office Max) so it's like a book (or Hollywood script?) That way, I can afford to splurge when I find a book that's not online or that has wonderful illustrations. I don't mind paying for art, but I don't like to pay for text if I don't have to. For someone who is really short on money, online boooks can be read straight off the computer screen. It's not as cozy as cuddling on the couch with a book, but the ideas translated will have just as much impact. When I copy an etext to my Word program, the lines only go halfway across the page. Is there must be a way to move the lines over instead of manually moving each line? The reason the lines refuse to go all the way across the page is because the computer is using paragraph marks to break up each line. But those paragraph marks can be removed and replaced with spaces. Here's how: Practice this on a short one page text until you feel comfortable with it. 1) While you're in Word and the text is already pasted on, click the bar across the top that says "edit." 4) Where it says "find and replace" put a paragraph mark. It will not work if you hit your enter button, you have to click on one of the five buttons along the right inside the dialog that says "more." 5) click on the button that says "special." 6) A list of characters will pop up, click on "paragraph mark." 7) You should see a ^p. bar to put a space there. Nothing will show, spaces are invisible. 9) Click one of the five buttons along the inside right of the dialog box that says "replace all." 10) When it's done, click "OK" and you're done!! What you end up with is one long paragraph! If you add a couple more steps, you can make the lines go all the way across the page while still retaining separate paragraphs. You just do a couple more "find and replace" steps, like the one above. 2) replace each remaining paragraph mark with a space. 3) replace each tab with a paragraph mark paragraph mark. 2) after I'm done with all the other replacements I want to do, I replace each zzz for a paragraph mark. I have a macro set up for printing books. Macros enable you to do all these things by clicking one button. What it is, in effect, is presetting your computer to do all these steps by itself. Once you record a macro, every time you want to re-format a book, you can go through and mark your poems (since a computer can't be programmed to distinguish poems!) then click your macro and walk away from your computer and it does all the other steps by itself!!!!! To record a macro with Word, you choose the "macro" option from your tools bar and select "record a new macro." You will need to pick a name for the macro, something less than 8 letters and no characters or spaces. From here, every step you take will become part of the macro. You will need to mark any poems before you record the macro if you decide to keep poems in their proper format. Now the macro is set up and ready to use!! To use it, paste your book into Word, pre-mark poems, click "tool" and "macro." Select the macro you recorded and "run." The computer will do the rest!!! This function has revolutionized my computer time! Any of you who received a copy of TCOO as a Word document from me have seen what a macro can do. The formatting - changing fonts, getting the lines to go all the way across a page, setting margins and double columns, was done at the click of one button and took my computer just a few seconds to finish. Need I say that macros are what makes my computer most useful to me? It is worth the attempt to take a few minutes and learn to do this. Question: Can you explain what a macro is, how in the world to save white spaces, how to replace paragraph marks with a space, or how to format the text into two columns? In order to do this, you'll need to set it up yourself. But it's not as complicated as you'd think. This is how it works in Microsoft Word: On your toolbar, there's an edit button. Within the edit button, there's a 'find and replace' dialog box. Computers were designed to do mundane, time-consuming tasks for us. So, using the 'find and replace' feature, I tell the computer to find all the white spaces by typing that into the 'find what' box. A white space usually is two paragraph marks, and the computer reads paragraph marks like this: ^p. The little carrot figure is above the number 6 on the keyboard. You'll need to type two of them: ^p^p Replace them with a tab mark, which is coded like this: ^t. That is typed into the 'replace with' box. Click 'replace all' and the computer will replace all the white spaces in one second, like magic! A MACRO tells your computer to do all of these steps on its own. From the 'tools' menu on the toolbar, choose 'macro' and then 'record new macro.' You'll need to name your macro and then, with the macro recorder on, do all of the steps you want>replacements, change fonts, columns, insert page numbers. When you're done, click 'stop recording' and you're done! To use your macro, paste a text into Word, click 'tools' on the toolbar, then 'macros' and then the macro with the name you gave it. The computer will go through all of the steps you've programmed it to do. The only thing you can't program a macro to do is find formatted text (such as lists, poetry and tables of contents) so the computer tends to turn them into one long sentence. I sometimes go through the text beforehand and mark those lines somehow with an asterisk or equal sign, then go back and replace those with paragraph marks to fix them and return them to their original format. Another small option is two columns and either AGaramond or Franklin Gothic Book font in size 8. It's condensed but somewhat easier to read. Question: How can I print etexts economically? Should I refill ink cartrudges? Buy paper in bulk? We set our printer quality to "toner saver mode" of 25% reduction. Our ink cartridges last quite a bit longer, without any discernible difference in print quality. We do not refill the cartridges. My dh is a computer tech. He is frequently called out to clean printer heads on machines with refilled ink cartridges - the toner clumps. I'm a bit of a perfectionist:s:and don't like blobs of ink on my printed pages. We shop for sales but always make sure to buy only the printer cartridges made for our printers (not the generic brands). IMHO, shopping wisely but still using quality 'ingredients' results in a better quality print-off of any e-book whether black text or colour illustrations. I took four big "books" I had printed to Office Max for comb binding and it cost around $15 for all four books, this included a sturdy backing and a clear vinyl front page. They look really nice. Someone posted to make sure when you do this, that they use a big enough binding to allow you to open the book flat. You can also download the e-text to a disk, and take it to Office Max for them to print off. Their website will give you a free quote and you can even submit the files over the internet. I think I will do this in the future to save wear and tear on my printer, as well as save money on my expensive ink cartridges. For me, it will be cheaper to do this. But for some folks it is cheaper to print it out theirselves.